They’re both snazzy descriptions — practically travel catnip. But after a week on São Miguel, one of the nine islands that make up the Azores, I found the Iceland and Hawaii analogies to be a bit, well, lazy and inaccurate. 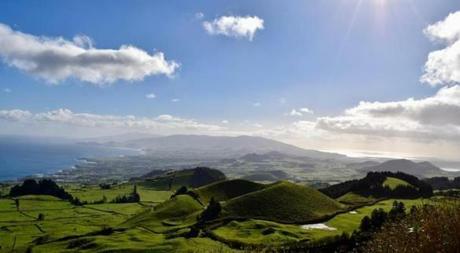 Yes, the Azores were created by volcanoes and have geothermal activity. Other than that, this place has its own pastoral personality, wonderful quirks, unique culinary offerings, and a lot of very narrow European city streets. If you’re gathering that I’m a fan, you’ve gathered correctly. I was told the wet and windy weather during my February visit was unprecedented. Yet even through the 50-mile-per-hour wind gusts and occasional downpours I could still see the beauty of the place. Yes, I would have appreciated that beauty more if my hair wasn’t consistently whipped into damp, wind-swept shrub, but I was too busy filling my mouth with local delicacies to complain. During those moments when the sun emerged I jumped into my tiny Volkswagen rental and chugged to the island’s scenic vistas, camera at the ready, and snapped pictures with the speed of a narcissistic teen on a selfie rampage. A view of Logoa do Fogo (Fire Lake) on the island of São Miguel in the Azores. In order to tell this story properly, I need to step back a week before I boarded my flight and talk about the angel who helped make this trip a success. Don’t tell my editor, but I didn’t have time to properly research São Miguel or the rest of the archipelago prior to departure. In an act of desperation and slight terror, I began wildly searching for an expert who might offer a couple of suggestions. I didn’t just find an expert, I found a native who took me under her wing and made me a part of her family vacation. Guida Ponte — the angel in question — grew up on São Miguel and now makes her home in Chelmsford. She’s a former chef who leads food tours in São Miguel (www.azoresfoodtours.com). Ponte happened to be vacationing with her family at the same time I was in the Azores and, in a Hallmark movie-like twist, we were even staying at the same hotel, called the Azor. Cut to my first night in the Azores and I was at Mariserra Restaurante having dinner with Ponte, her husband Ed, their son Andrew, her brother Manuel, plus her cousin Theresa. Someone put beef skewers in front of me while they passed around shrimp, seafood rice, and migas, a dish made with kale, bread, and either beef or fish. French fries seemed to be everywhere, but mostly entering my mouth. When I returned to the hotel I flopped on the bed like a bloated seal and thanked my Lucky Charms I had somehow wound up with this family and the magically delicious dinner. 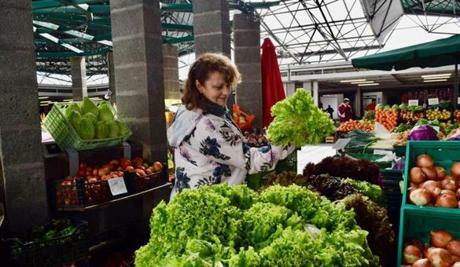 The next morning I set out with my adopted family for the farmers’ market in Ponta Delgada, the capital of São Miguel and the largest city in the Azores. The expression “kid in a candy store” is trite as trout but accurately described Ponte’s smile at the market. 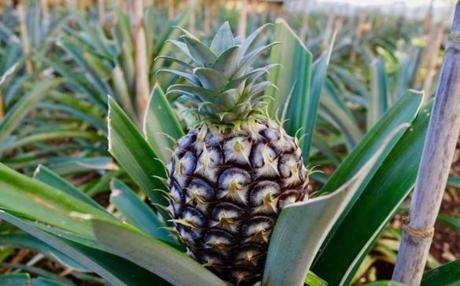 She eagerly led me around to vendors selling the island’s pineapples, which are smaller than those grown in warmer climates. The semitropical climate here also means that strawberries and carrots are larger, and every time I turned around, Ponte was chatting up another farmer and handing me an exotic fruit to try. By the time we had picked our way through the market, the very shy sun began a game of peek-a-boo, which meant we loaded into Ponte’s rented van and zoomed to Lagoa do Fogo, which translates to Lagoon of Fire. It’s one of São Miguel’s striking volcanic crater lakes. The volcanoes here are no longer active, but they left a dramatic landscape behind. 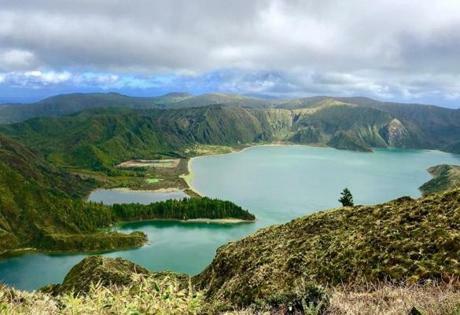 The most famous crater lakes on São Miguel are Lagoa das Furnas, Lagoa das Sete Cidades, Lagoa do Congro, and the aforementioned Lagoon of Fire. If I were traveling solo, I would have rushed off to the next scenic spot and lunch would have been an afterthought. But because I was with Ponte and family, food was an important part of the week and so we lingered at the oceanfront restaurant Alabote. Long lunches are a vital part of the lifestyle here, and it didn’t take much convincing for me to get on board. I opted for local beef, Ponte’s grandson Akio had joined the brood and ordered a traditional southern Portuguese dish of clams and pork. The unlikely pairing sounded thoroughly unappealing, but I decided to taste, and it was fairly amazing. Our lunch spot was located in Ribeira Grande, a town known for its beaches and surfing. Because of the wild weather, neither beaches nor surfing were on my agenda, but I’d recommend them, along with kayaking, diving, sailing, whale watching, and canyoning during the summer months. São Miguel is known for its outdoor activities. I could have used a few more activities to fight back my ever-expanding waistline. São Miguel is also known for wellness. There are spas in Ferraria and Furnas. Hot, mineral-laden water from volcanic springs emerge to the surface and make for excellent soaking pools. People have soaked in the waters in Furnas since the 17th century. I stayed until I was thoroughly pruned. If you have the time, split your stay between Ponta Delgada and Furnas. When I say geothermal hot springs you’re likely thinking “Oh, like the Blue Lagoon in Iceland.” Let me stop you right there, chum. The Blue Lagoon is packed tight with vacationers like a crate of clementines. The hot springs in Furnas were not overpopulated. You can also soak at Caldeira Velha, a hot springs waterfall with tubs. This is a good time to interject that it’s a smart idea to hustle yourself to the Azores now. We have the luxury of direct flights from Boston to Ponta Delgada on SATA , but last year New Yorkers gained direct flights through Delta. That means more tourists and more crowded roads. Currently the only traffic jams are caused by cows that cross streets to get from one pasture to another. I’m not going to brazenly declare that the Azores are the next [fill in the name of a hot new vacation destination here], but they likely will be. If you opt to travel from Boston, the flight is about 4½ hours. It’s about 2 hours from Lisbon. You want more nature, you say? OK, but give me a moment to plug Queijadas de Vila Franca do Campo, which are rich, small tarts made of egg yolks, milk, and sugar. They were created by nuns in the 1600s. I purchased a box to bring home for friends, and instead polished it off in my hotel room. Please, don’t judge too severely. While we’re on the subject of sweets, my new family stopped at a carnival celebrating . . . well, I’m not sure what it was celebrating, but it included malassadas, which is Portuguese fried dough. They had me at fried. They also had me at dough. 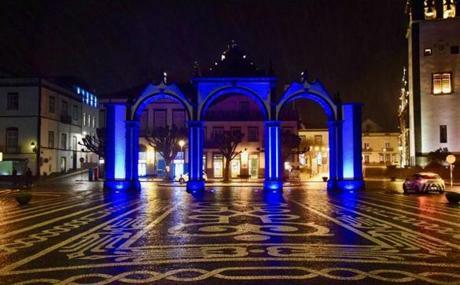 The Portas ds Cidade in downtown Ponta Delgada on the island of São Miguel in the Azores. I had originally planned on visiting more than one island during my stay, but thankfully Ponte talked me out of it, otherwise I wouldn’t have had time to visit the only tea plantation in Europe, the pineapple plantation, or the Romantic Gardens where we had a private tour with a man who just wrote a book on the place. I tried an unusual stew at Caldeiras e Vulcões. The dish is cooked geothermally in heated openings in the planet’s crust, known as fumaroles. If the daily activities sound like a lot — and they were — nights with the family were equally busy. I found myself at the hotel casino with Ed until 3 a.m. and downing healthy pours of wine courtesy of cousin Theresa. Oh right, I was here for work. “I’m also curious to see what the story will look like,” I told her. 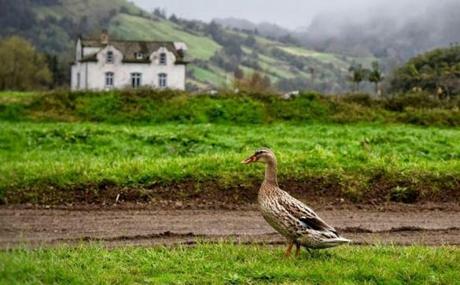 A duck wanders near Cete Ciadades in São Miguel in the Azores. When the sun miraculously reappeared after a weekend of hiding, I booked a cycling tour through Azores Adventure Islands. I biked around the hills of Sete Cidades, where guide Andre Gouveia explained the geography below. This time I remembered to take careful notes. Before we parted ways, Gouveia asked me if I’d like to join him for dinner with his parents. I kindly thanked him, but explained that I already had a family in the Azores and I couldn’t imagine spending a night without my adopted mom and dad, brother Andrew, and, of course, cousin Theresa.